This small but busy port lies at the east end of a narrow fjord. 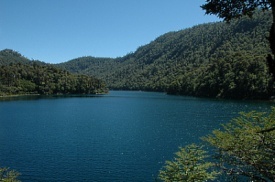 Located only eight miles across a large suspension bridge from Puerto Aisen, it was from Puerto Chacabuco that the first road (actually a trail) was started in 1903. The road twists around cliffs and through dramatic landscape, reaching finally the Rio Simpson National Reserve. Stretching along the Simpson River, the reserve is squeezed by sheer cliffs and graced by numerous waterfalls. Puerto Chacabuco serves as a popular jumping-off point into western Patagonia and as a hub for ferries that connect the port with Puerto Montt and the Island of Chiloe.